Chinese food is famous for it’s mixture of sweet and sour, and we all know that a lot of sugar and salt is used. But I do like a good Chinese dish and this one is pretty healthy so no need to worry. Pork is a great source of protein and is full of health friendly vitamins such as Selenium, Zinc and Vitamin Bs. Pak Choi is an excellent source of vitamin C, A, B and K and healthy minerals. Brown rice is a great slow releasing carbohydrate to provide you with longer lasting energy and is full of anti oxidants, fibre and minerals. So, have a try and let me know what you think. – Place the oil in a non stick frying pan or wok and heat over a medium high heat. 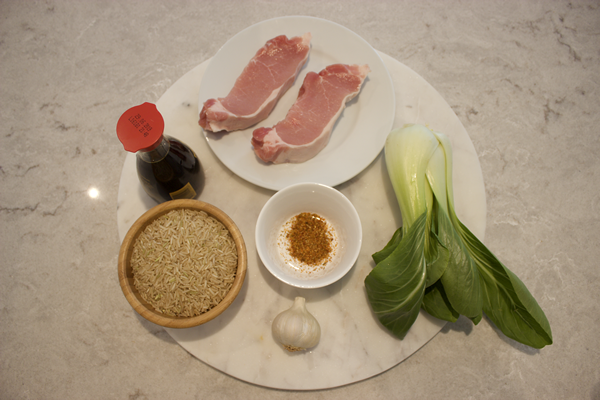 – Add the pork, Chinese 5 spice and soya sauce and cook for about 3 minutes or until the outside of the pork is cooked. – Add the pak choi to the frying pan and turn down the heat slightly to a medium heat. Cook for a further 3-4 minutes, stirring occasionally. – Add the garlic to the pan and cook for a further minute. 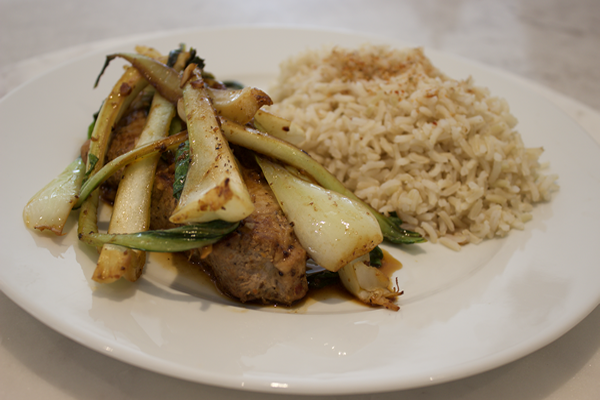 – Check that the pork is cooked through completely and serve with the brown rice.